1. 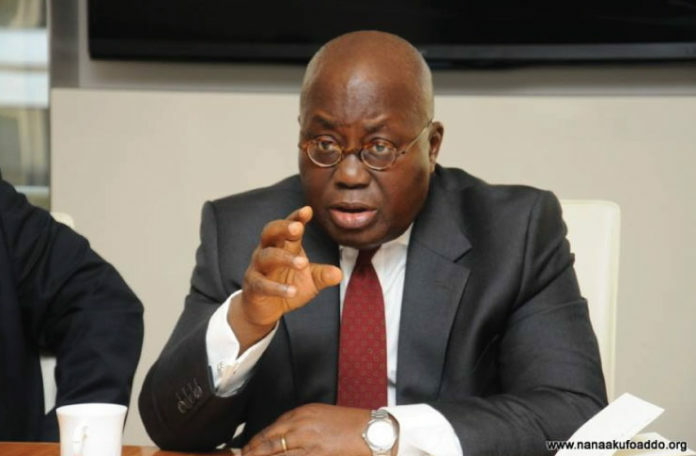 Akufo-Addo cannot act against Kwesi Nyantakyi because doing so will open a can of worms that Akufo-Addo fears. Nyantakyi was a major financier of Akufo-Addo's bid to be in power; and Akufo-Addo didn't6 question the source of his largesse. However, when Nyantakyi was caught5 pants down by Anas Aremeyaw Anas, Akufo-Addo impulsively acted against him, removing him from office to create the impression that he was ready to set him as a good example for his fight against corruption. It was never to be so. yantakyi still has Akufo-Addo in his pocket, which explains why he can't be prosecuted (as the Attorney-General has told us). So, why remove Nyantakyi from office and disband the GFA if no crime was committed. The conspiracy thickens. 2. Over-expenditure on foreign travels by Bawumia and his wife has hit the airwaves and alarmed Ghanaians. Whether Bawumia went out with 16 officials or 21 is moot. The bold ones in the NPP have already accused him of over-expenditure and insensitivity. His wife is reported to have gone out with 21, which has raised eyebrows. What has Samira Bawumia got to do with UNCTAD? 3. Some members of the NPP in the Atiwa area are reported to have defected to the NDC, making serious claims that point to what is simmering all over the country: that they have come to realize that they are merely used by Akufo-Addo t6o win political power for the good of himself and those under his armpit. This Atiwa case is interesting, especially because of the history of political activities in that area that has favoured the NPP all these years. Atiwa is a no-go area for the NDC, to put it plainly. As Akufo-Addo himself said sometime ago, "Atiwa kuraa ye kyere wom bi" ("Literally meaning that in Atiwa, we showed them something by way of flexing muscles (clear aspects of our recourse to violence to prevent them (meaning the NDC) from winning political capital therefrom). Now, the main mobilizers of the NPP there have chosen to break ranks. Any lesson here? Again, just imagine how the people in this area will behave when the Chinese take over their centuries-old natural resource to exploit. Ibrahim Mahama sought it but was denied. A time-bomb here!! 4. The revisiting of events surrounding the abduction and murder of the three High Court judges and Army Major Acquah that Joy Fm has set in motion is overshadowing everything. All the noise is against Rawlings as if it will reverse what had happened in those days. I intend to write a comprehensive opinion piece on this "resurrected dead horse" and won't say much on it for now except to suggest that whatever it is that is motivating this move won't add anything new to Ghanaian politics. Those like the so-called former Rawlings body-guard (Atabuga) putting Rawlings back in the limelight on this score could have done better if they had eliminated Rawlings when they were close to him at the time instead of fearing their own shadows and coming out now to make ugly noise. Again, let me be blunt here to say that all the noise that Kweku Baako is making against Rawlings fits into his own ill-conceived agenda of "stripping Rawlings naked", which he set out to do under Kufuor but hasn't been able to do to date. It is not this Atabuga nonsense that will provide the ammunition for him to do so. In any case, it's all diversionary. Ghanaians are feeling the pinch under Akufo-Addo and don't need any more political rhetoric to assuage their doubts, fears, and whatever else that has quickly made them wonder why they put Akufo-Addo in power. What is happening under Akufo-Addo beats commonsense. Having boasted of having the solution to Ghana's problems that the NDC didn't have, why should Team Akufo-Addo not give Ghana and Ghanaians anything drastically different to prove its worth? Stealing Mahama's glory by way of projects and foresight in positioning Ghana for a take-off into a brighter future is their lot. Let someone tell me anything new that has issued forth from the Akufo-Addo camp and I will revise my notes. Don't they tell me anything about the free SHS programme that has already---and quickly---torpedoed their good intentions. What else is there to praise Akufo-Addo over? Even as of now, he is on Quixotic ventures, lost on the radar screen. Where exactly is he in the world today? Such a character is Ghana's woe. Probably, he knows it himself, which explains why he would tell Ghanaians that he hasn't yet told the NPP power brokers whether he would contest Election 2020 or not. So inconsistent and irresponsibly deceptive. A typical con-man of Al-Houdini's type in Ghanaian politics. Didn't he say all that gas before clipping all other contestants to make himself the flagbearer for Election 2016 that he won by default? And it is the same default that will show him the way out. Folks, we will keep monitoring the situation to know what we want to know so we can make our voices heard. Meantime, happy reading and commenting. The author has authored 1327 publications on Modern Ghana. Disclaimer: "The views/contents expressed in this article are the sole responsibility of Michael J.K. Bokor, Ph.D. and do not neccessarily reflect those of Modern Ghana. Modern Ghana will not be responsible or liable for any inaccurate or incorrect statements contained in this article."